Unless I’ve made a big batch to freeze for later, I rarely think of soup as a weeknight affair. I mean, first, there’s all the chopping. And then there’s the sautéing and boiling and simmering. It’s more of a commitment than I want to make after a long work day. But this 5-Ingredient Curried Butternut Red Lentil Soup is a recipe that’s made for weeknight dinners. 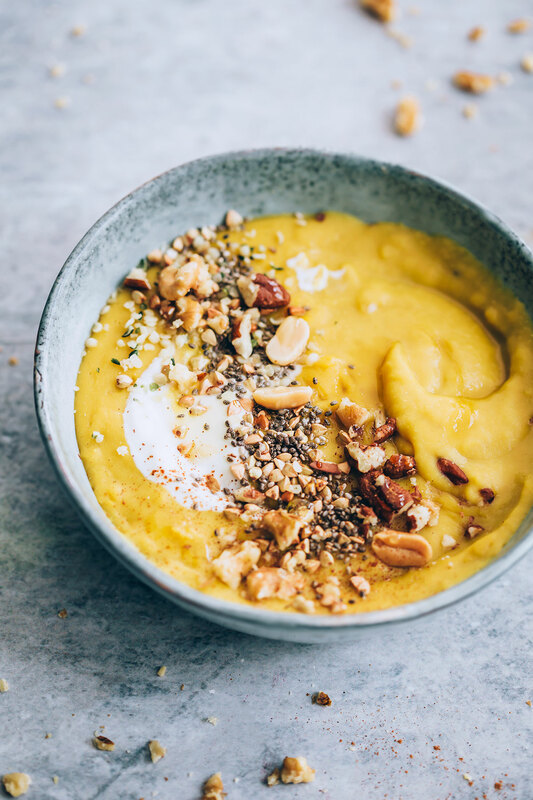 Not only is it made with only 5 ingredients–well, not including things you already have on hand like salt and water–but it uses frozen butternut squash to cut down on prep time. And as if that wasn’t enough, it only requires enough simmering time to soften the red lentils. Which isn’t much time at all! A lot of pureed vegetable soups aren’t very filling, but the red lentils in this soup give it a little more staying power. A quarter cup of dried, uncooked red lentils packs in a whopping 13 grams of plant-based protein. When it comes to garnishing this soup, you’ve got plenty of options–aside from eating it as-is, which works too! 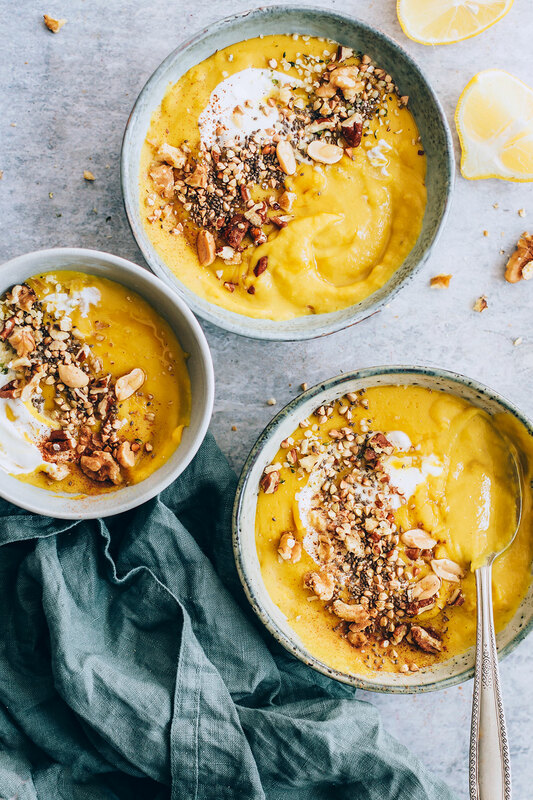 You can keep it simple with a swirl of yogurt or crème fraîche and a sprinkling of chopped cilantro; make homemade croutons or baked chickpeas to add some texture; or add chopped nuts and seeds for even more protein. 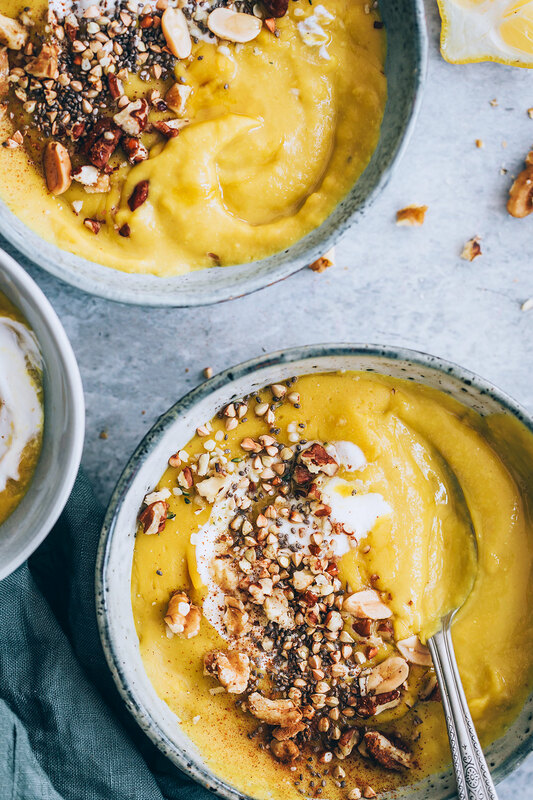 Using frozen butternut squash saves on prep time, making this soup ideal for busy weeknights. Melt the coconut oil in a large pot over medium heat. Add the onion and a pinch of salt; cook for about 4 minutes, or until softened. Stir in the curry powder and cook for about 1 minute, until fragrant. Stir the lentils into the pot, then pour in the water and add the squash. Bring the mixture to a boil, then reduce heat to a simmer. Cook the soup uncovered for about 15 minutes, or until the lentils are falling apart. Cool slightly, then transfer to a blender and puree until smooth (or use an immersion blender if you have one). If you'd like a thinner consistency, add more warm broth or water. Season with salt and pepper to taste. Ladle the soup into bowls and add your favorite toppings. Paired with a sandwich or salad, this recipe will serve a family of 4; if you prefer a bigger bowl instead, you'll get about 2 servings.